Imagineering the future means sweating the details no matter how small, and future fashion has always loomed large when writers and artists want to get the image just right. What will our heroes and heroines wear on the day after tomorrow? 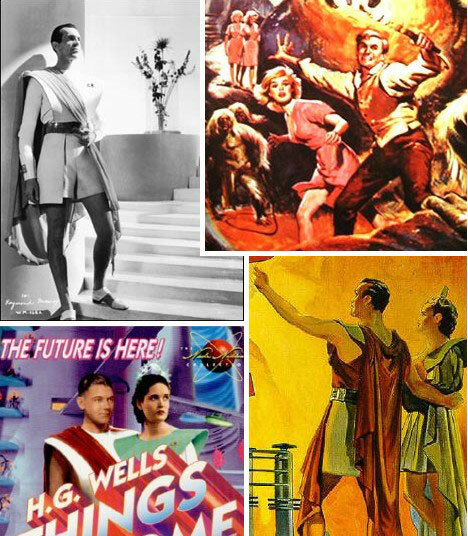 The earliest sci-fi writers didn’t worry much about future fashion, or clothing altogether – motion pictures were just getting off the ground when H. G. Wells was writing The Time Machine, First Men in the Moon, Things to Come and other masterpieces of the Edwardian Era. It was left to Hollywood or The Rank Organisation to sketch out suitable suits for the brave human defenders of a retrofuture world. 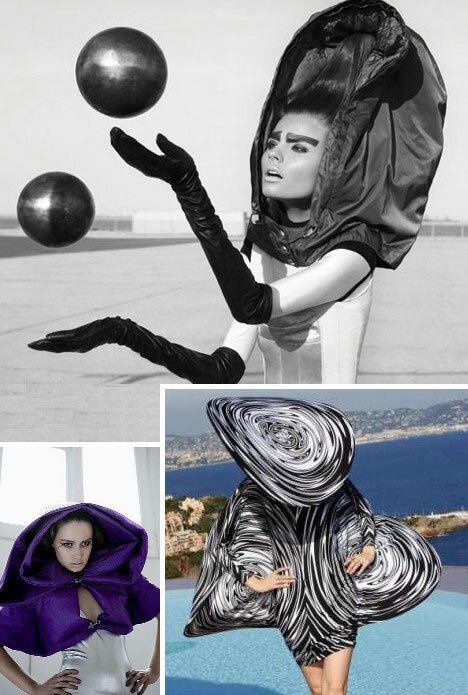 Funny how it seems that when projecting future fashion trends, representations are either too mild or too wild. For your wonder and amusement we present some of the latter. Or in this case, the hatter (of the mad persuasion). Manish Arora has a futuristic name, and while it doesn’t hold a candle to Zaphod Beeblebrox it DOES give a broad hint to what he’s been up to. 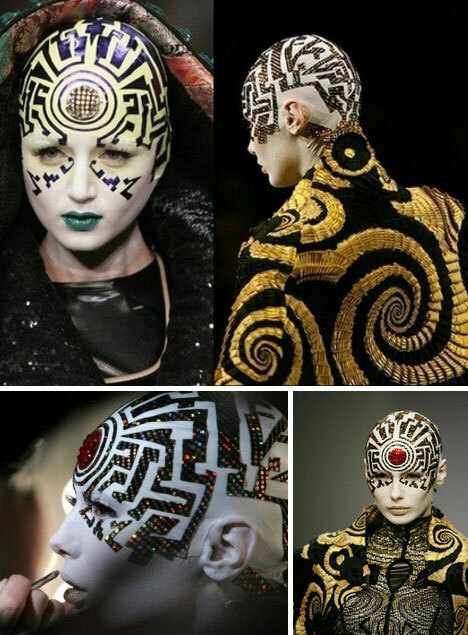 Androidal fashion is the Indian designer’s niche, and he exploits it to the fullest with the cybernetic ensemble above. The ancients used to call comets “hairy stars” but today we know better, or so we would like to think. 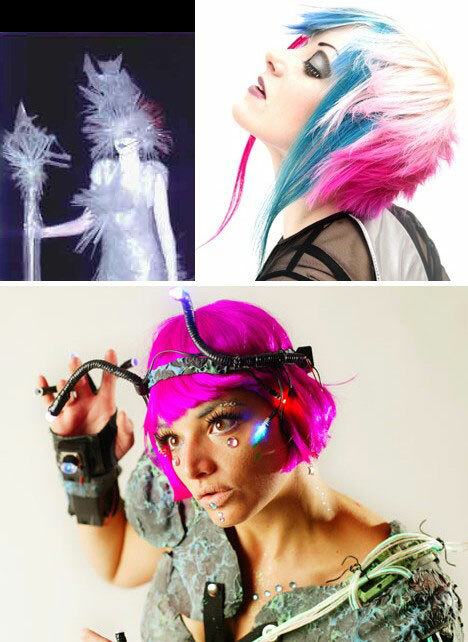 We’re not sure what the designers of these hairdo’s were thinking but it’s certain their ideas were far a head of their time. Guys don’t get off so easy, even old-style he-man heroes like John Carter from Edgar Rice Burroughs’ Martian odysseys. Carter, oft portrayed in Tarzan=Spaceman style by noted sc-fi illustrator Frank Frazetta, was equally adept at womanizing the local Mars maids while fighting off hungry interplanetary beasts – often simultaneously. All in a day’s work for Carter, a “red blooded American civil war hero and fighting man from Virginia” who is set to slash his way across the silver screen before 2012. Well, not really, but they sometimes look the part… which means they look green. Forget the gray aliens, where da green women at? Star Trek’s writers knew all too well that James T Kirk would not be able to resist the charms of a green-skinned Orion slave girl. Then again, when did Kirk resist ANY female of ANY species? 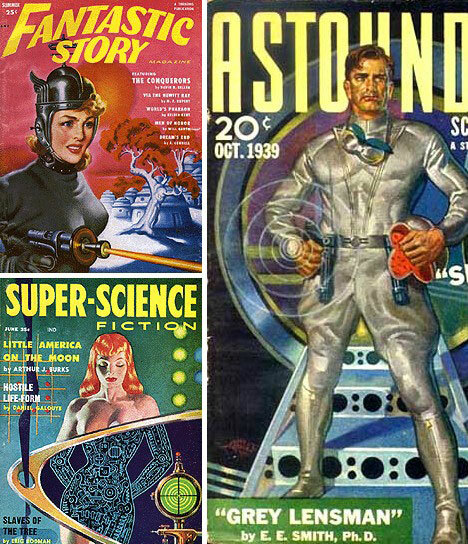 Pulp magazines of the 1930s through the 1950s played their part in setting fashion trends for the Space Age and beyond. The cover art needed to show exactly what their mainly young male readership demanded: womanly women and manly men. 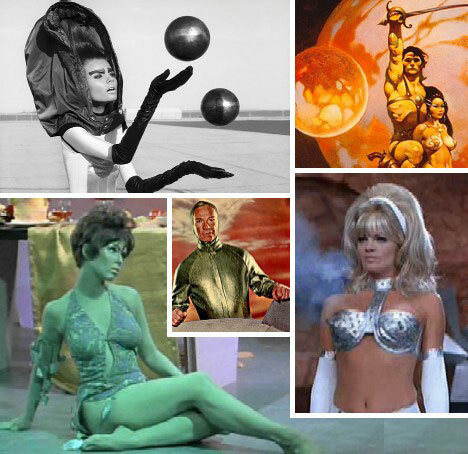 Movies of the mid-century put a peculiar stamp on futuristic fashions, so much so that one wonders whether the producers were serious. 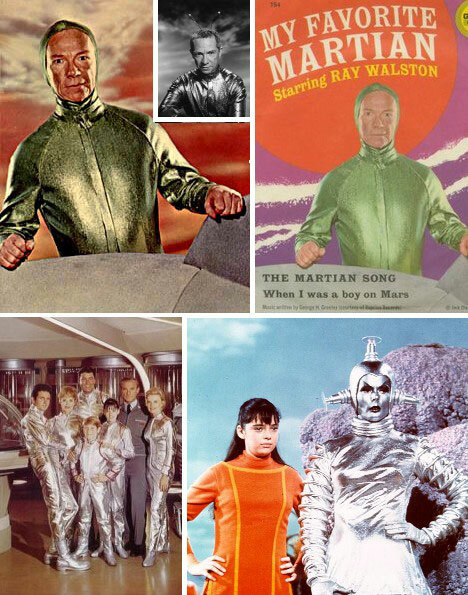 Other times budget considerations took priority, as in the costumes from 1964’s Santa Claus Conquers The Martians (above left) – featuring a very young Pia Zadora. In the future, our clothes will be shiny… or so it seemed to fashion forecasters of the 1960s. 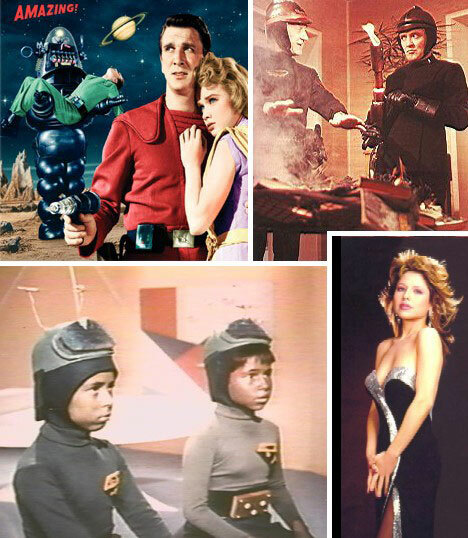 Monotone TV demanded something extra when depicting people of the future but with the advent of color TV, letting it shine looked all too ludicrous. 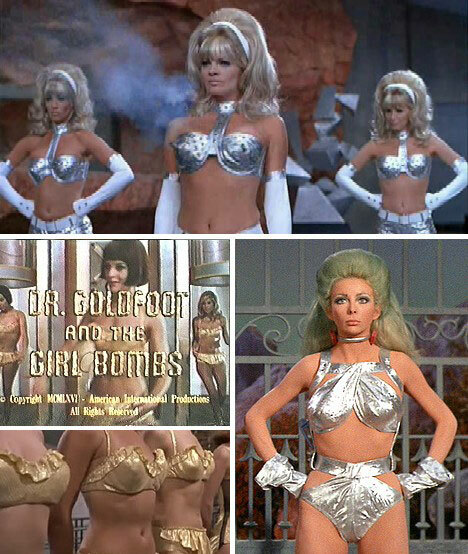 Mike Myers was a child of the sixties and as such, he had to be influenced by 1965’s Dr. Goldfoot and the Bikini Machine and the ’66 sequel, Dr. Goldfoot and the Girl Bombs. Femme fatales, secret agents, fembots… but mainly fembots! In the future, women will be beautiful, deadly and barely dressed in gold or silver swimwear. Looks like they got that right at least! Closing out this feature is that cybernetic sweetheart, Seven of Nine from Star Trek Voyager. Put plainly, Seven makes the list because, in her skintight metallic bodysuit, she makes us lust. Jeri Ryan may have moved on to bigger and better roles after the reformed Borg she played in Voyager but she’ll never be able to top this one. Resistance is futile? Who’s resisting? And as for the future, it certainly looks exciting.